Mother's Necklace 2 by Landstrom's Black Hills Gold. 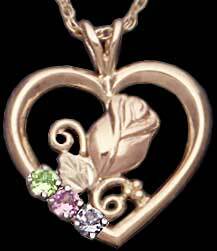 Open heart pendant with a very feminine pink gold heart inside and up to six birthstones representing loved ones in the family. This mother's necklace is guaranteed for life by the leader in Black Hills Gold jewelry,Landstrom's Black Hills Golds.